The subject property taken from the tar road leading to Pulau Betong town. The land is flat. Both sides of the land is inhabited by locals. The land is elongated with the width about 105 feet and the length about 730 feet. Betong town, the fishing village and the beach is about 1 km away. Electricity and water is available. The view of the land taken from the back towards the front. The buildings seen here are the restaurants built by the previous tenant. In front of the property is a small hill. 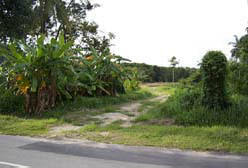 The pond seen here actually comprises the subject property and two other lots. The pond was previously used for rearing fish and also as an attraction for the restaurant. However due to differences in opinion, this venture has been abandon. 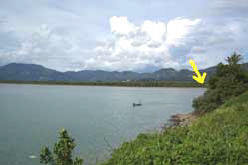 There is a river separating the subject property from the mangrove swamp / sea. The water level seen here is during low tide and the land is much higher than the river. From this river, one can navigate a boat or yacht to the fishing village and out to the sea. 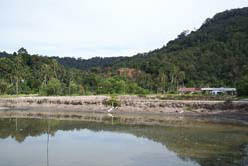 This is the view from afar after Betong town but before reaching the beach. 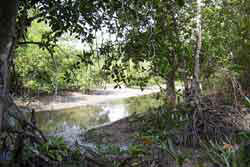 The land is hidden behind the mangrove swamp. It looks like this land is in a lagoon.